Menlo Park, Calif.―The William and Flora Hewlett Foundation and Resources Legacy Fund announce the new ‘Open Rivers Fund’ to support broad-based community conservation efforts and the removals of aged dams. The William and Flora Hewlett Foundation marked the organization’s 50th anniversary by granting $50 million to Resources Legacy Fund, to establish a new program, the Open Rivers Fund. It will be the largest fund ever created dedicated to supporting local community efforts to remove obsolete dams and restore rivers across the western United States. During the next 10 years, the Open Rivers Fund will support the work of local groups and agencies to advance dam removal, and related river restoration and infrastructure modernization. Projects will be undertaken with widespread community support and collaboration, and will yield multiple community and environmental benefits. The Open Rivers Fund launches with three initial projects, including removal of the Matilija Dam, one of the largest dam removal projects in California. The Open Rivers Fund is a program of Resources Legacy Fund, a nonprofit which has significant experience in developing and implementing complex conservation programs. Resources Legacy Fund has worked on river restoration and dam removal projects across the West. It has developed a systematic approach to identifying, assessing, and effectively pursuing project opportunities in collaboration with diverse interests. There are more than 14,000 dams across the country identified by engineering experts as “high hazard.” By 2020, roughly 70 percent of dams in the United States will be more than 50 years old. Removing dams that no longer serve their purpose and are structurally unsafe becomes more urgent each day. Many communities have already begun work to take these dams down. The projects of the Open Rivers Fund will represent years, even decades, of local support and collaboration. River restoration and dam removal projects provide lasting economic benefits to local and regional communities and government agencies. These efforts can save taxpayer money, as aged dams require unnecessary taxpayer investment to repair or maintain failing infrastructure. Removing outdated dams protects local residents and communities from unsafe and failing infrastructure. River restoration and dam removal also supports local communities by offering increased opportunities for recreation, cultural use, and tourism. As important, removal of older dams will allow fish like salmon and steelhead trout to migrate and spawn, promote healthy river systems, improve water quality, buffer communities from storms and floods, and help many species survive the stresses of climate change. “Thanks to the Hewlett Foundation’s generous support through the Open Rivers Fund, Resources Legacy Fund is pursuing dam removal and river restoration opportunities with communities throughout the West,” said Michael Mantell, president of Resources Legacy Fund. “The Open Rivers Fund will make it possible for communities to better manage their rivers and water infrastructure. The Fund also will test new models for reducing the significant financial, legal, and process hurdles that have stalled dam removal and river restoration in the past, and empower communities to directly address their environmental and infrastructure needs,” Mantell added. Matilija Dam on Matilija Creek, a tributary to the Ventura River in California – Built in 1947, the 168 foot high Matilija Dam is located in Ventura County, California, along Matilija Creek, a tributary to the Ventura River. With the reservoir behind the dam nearly full of sediment, the dam is no longer effectively serving its original purpose of water storage for agriculture. The condition of the dam is deteriorating, causing safety concerns for downstream communities. Removal of the dam will reestablish the flow of sediment downstream, which will help replenish the eroding beaches at Surfer’s Point in Ventura, at the mouth of the Ventura River. By alleviating beach erosion, it will reduce the need for costly coastal restoration projects. Removing the dam would restore steelhead access to dozens of miles of critical habitat in the headwaters of Matilija Creek. The project will also address pressing safety and liability concerns, and enhance recreational opportunities for surrounding communities via the Ventura River Parkway—a continuous network of parks, trails, and natural areas along 16 miles of the Ventura River. The Open Rivers Fund will allocate $175,000 to support various efforts toward the dam removal. Rogue River Basin in Oregon – More than 124 miles of the Rogue River are federally designated Wild and Scenic. Located in the southwest corner of Oregon, the Rogue River main stem is now free-flowing for more than 150 miles following prior dam removals. Despite this progress, hundreds of known barriers remain in the 3.3 million acre Rogue River Basin that inhibit fish passage and sediment transport, which in turn impact the long-term viability of the fisheries in the Basin, especially in the face of climate change. For that reason, fish passage barriers on Rogue River tributaries are a high priority for removal to benefit native spring and fall Chinook salmon, threatened coho salmon, winter and summer steelhead, cutthroat trout, and rainbow trout, among other native fishes. The Fund will support groups such as the Rogue Basin Partnership and the Rogue River Watershed Council to pursue a framework approach to river restoration that will focus on removal and modernization of up to 50 dams and river impediments over ten years. 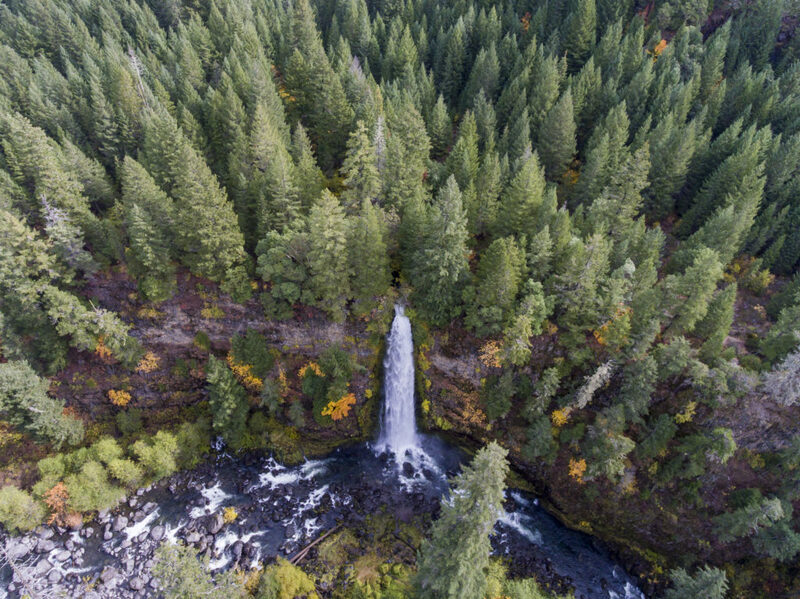 Fund support will enable groups to coordinate their efforts and advance planning, design, and implementation of removal, restoration, and infrastructure upgrade projects on priority tributaries to the Rogue River. Nelson Dam and Yakima River Watershed in Washington – The Nelson Dam is an 8-foot irrigation diversion dam on the Naches River in Washington, just upstream of the City of Yakima on an important salmon-bearing river that is the largest tributary to the Yakima River, which flows into the Columbia River. This project will involve the replacement of the dam with a roughened channel, which is a proven and technically innovative structure that will allow free passage of fish and increase sediment flow which will improve floodplain habitat upstream and downstream in areas important for fishery spawning and rearing. Removal of the dam also will reduce flood risks to the community, and decrease costs for operating irrigation diversions. This project is part of a broader effort to implement the Yakima Basin Integrated Plan, which is supported by agencies, irrigation districts, nonprofit organizations, and the business community, to advance a fully-functioning watershed. The Open Rivers Fund is designed to be catalytic in nature, to jumpstart project development and funding processes by providing resources to communities that are working to get dam removal projects off the ground. It will reduce the cost barriers for these projects, with the ultimate aim of improving water quality; solving safety, sedimentation, and dam obsolescence problems; and enhancing habitat for important water and land species, while strengthening flood control, water supply, agricultural production, energy production, recreational, and other economic uses. Media resources, including photos and videos, are available here. Read statements of support from national leaders and community members. Read Open Rivers Fund overview fact sheet and FAQ.